Fremantle prison YHA is a totally unique place to stay in this historic port city in Western Australia. If you are looking for great value accommodation and something completely different just two minutes from the town centre, this is the perfect choice for the discerning traveller. 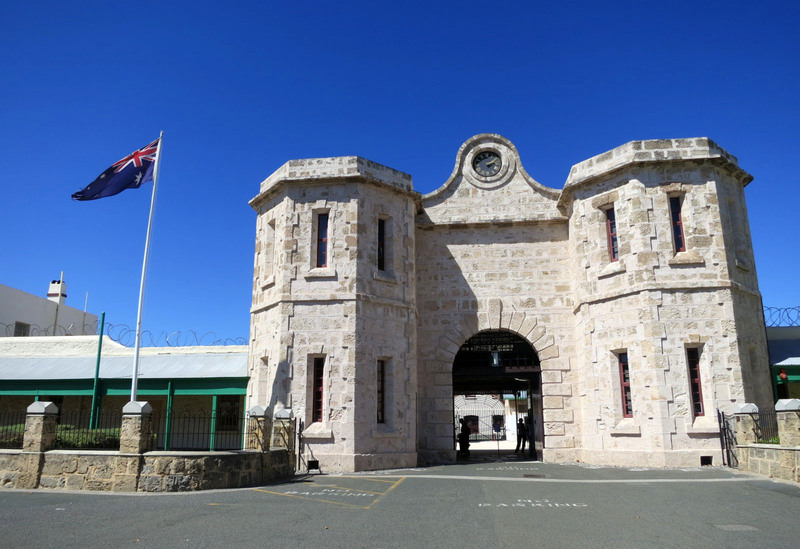 The prison itself is an award winning tourist attraction and WA’s only World Heritage site. The prison was built by the convicts themselves in the 1850’s and operated as a place of incarceration until its closure in 1991. Tours operate daily and it is well worth a visit to learn about the fascinating history of this building and the people that were held within its walls. Next door to the men’s prison, the former women’s prison has now been leased by the YHA and sensitively turned into a hostel with a range of short stay accommodation which can cater for up to 202 guests. 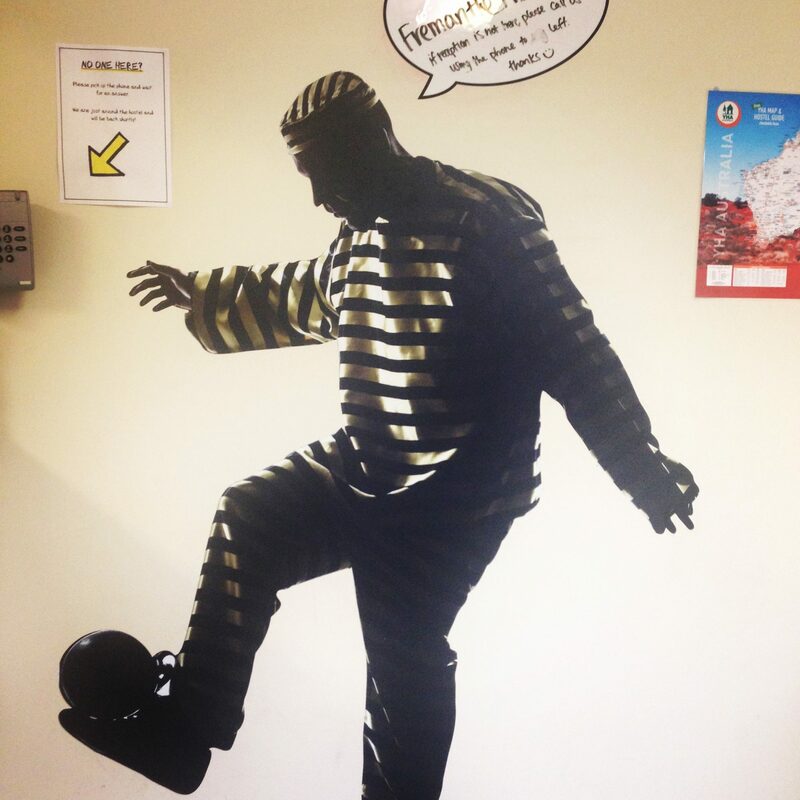 The old cells are now well equipped bedrooms and there are multishare dorms, double and twin rooms, some ensuite. There’s lots of common space for relaxing, cooking and jumping on the free WiFi inside. 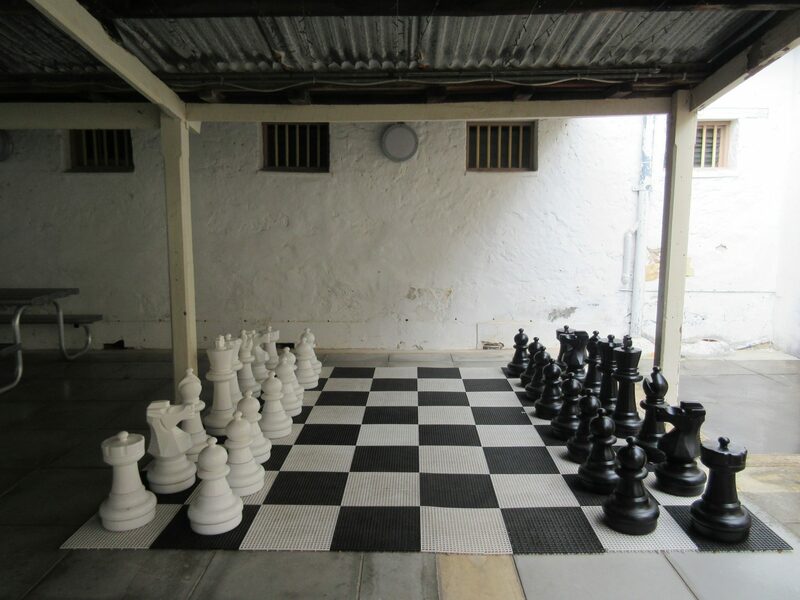 The old exercise yard has also been put to good use, with a few hammocks and a giant chess board. It’s all quite atmospheric with lots of stories about the unfortunate inmates and their escape attempts illustrated about the building. Not something you need to worry about if you stay there! 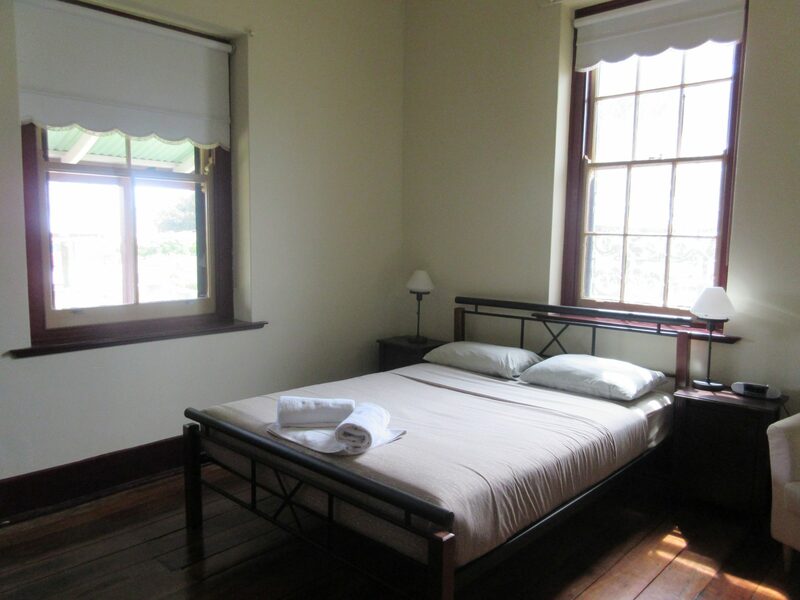 In addition to the hostel accommodation there are three delightful colonial cottages you can stay in which have been carefully restored within historic regulations. 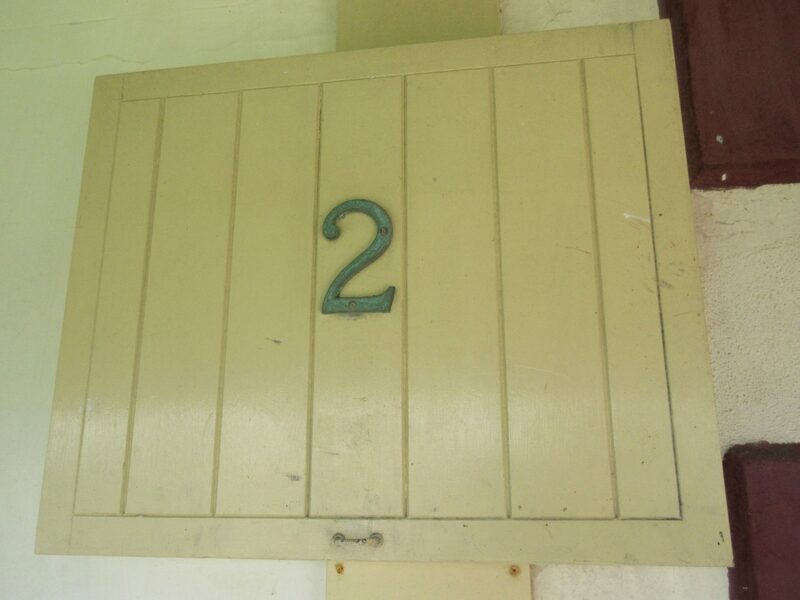 We were lucky enough to stay in no 2 the old Guardroom, constructed in 1857, it was initially designed to accommodate 19 men! 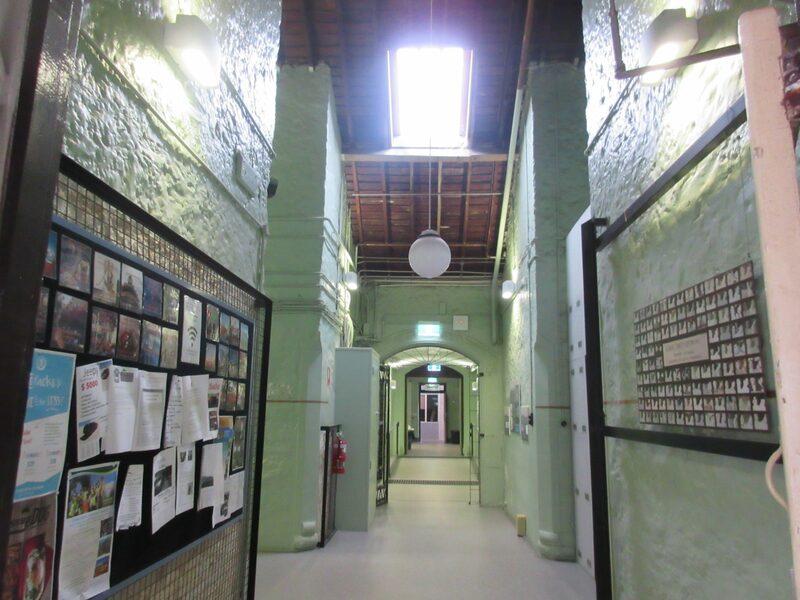 Between 1891 and 1897 it was converted into quarters for the women’s prison warders in the newly opened Female Division of Fremantle prison. 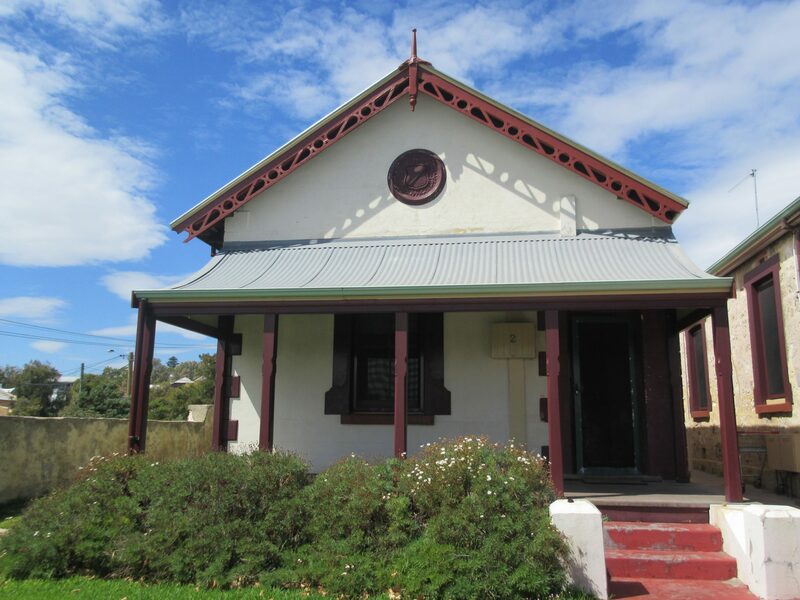 This house was also used at one time by the chaplain, to house his rocks and minerals collection which became the basis of the WA museum. 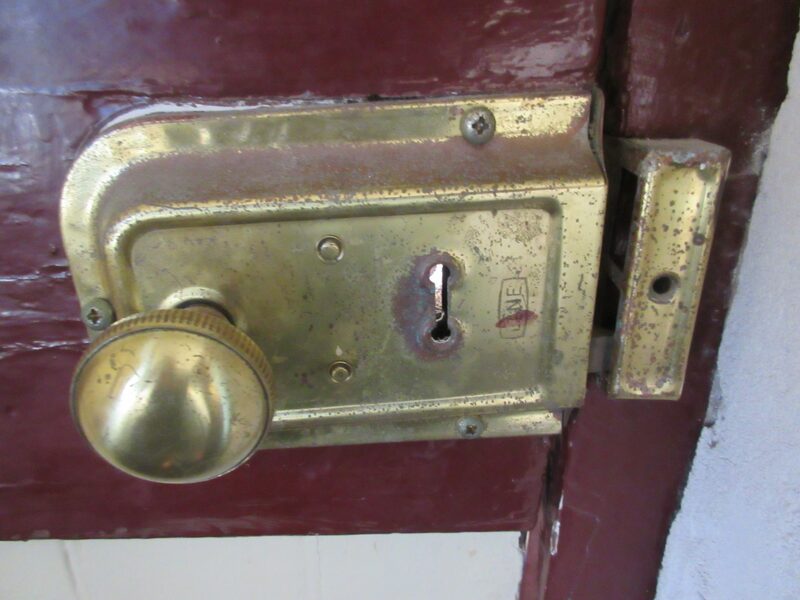 The original beautiful wooden floors, doors, locks and sash windows have been retained, and there is a real sense of staying in a historic building with so many stories it could tell. There’s lots of space and a well equipped kitchen. The cottage can cater for six to eight people – ideal family accommodation. 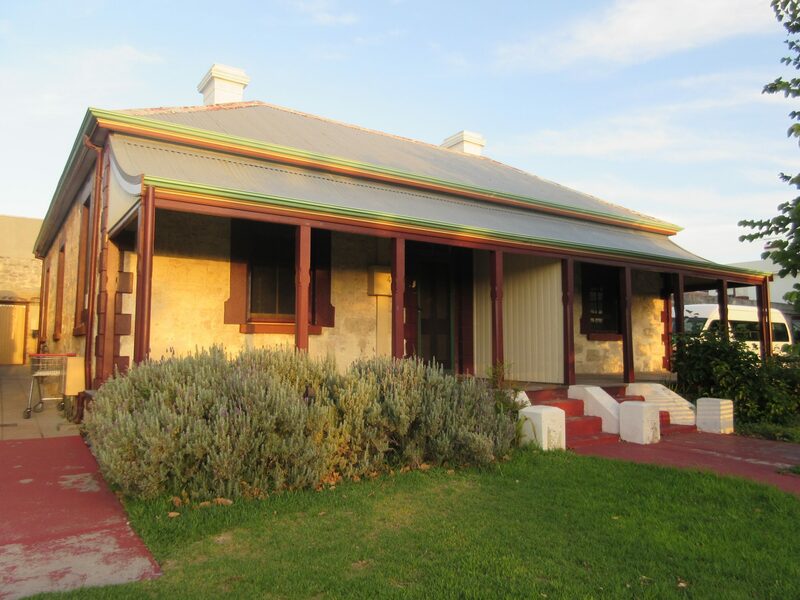 These cottages were cleverly built, opened up in the morning to make the most of the cool breeze, and then they would have been closed up in the afternoon to keep the cool air inside the stone building, when the hot afternoon wind blows in, known as the Fremantle doctor. Cottages no 4 and no 6 were accommodation for the Matron, the assistant Matron and other female warders. We thoroughly enjoyed sitting out on our veranda, watching the sunset (WA sunsets can be quite stunning) having a cool drink and looking over the city from our hilltop dwelling. In the early prison days, there would have been a view right down to the sea. The view is somewhat obstructed by the city now, but the bonus is that it’s a two minute walk into the heart of Fremantle itself with its shops and lively bars and restaurants. 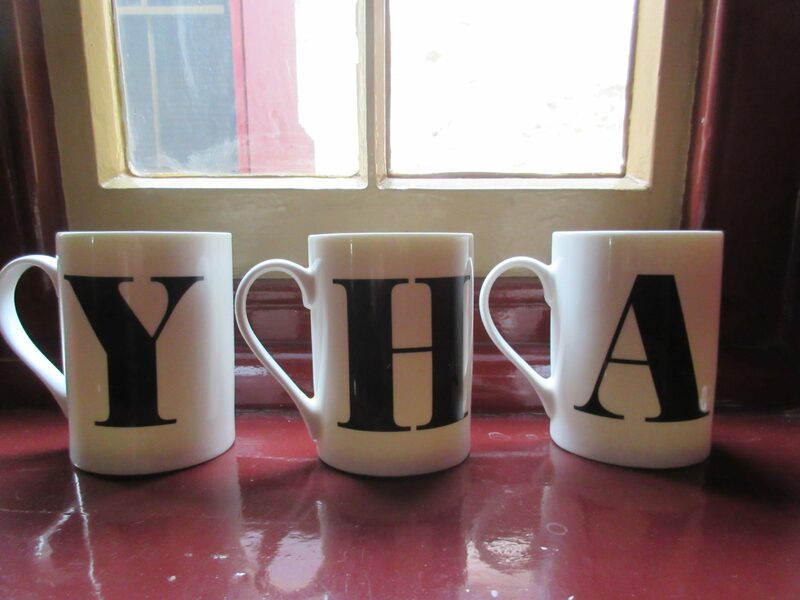 After five years of planning,The YHA opened this resource in May 2015, and has done a great job converting these buildings and creating a range of accommodation in an excellent location. There is information everywhere about the characters that found themselves in this unfortunate situation and it gives a real sense of the harsh lives of people in times, not so long past. 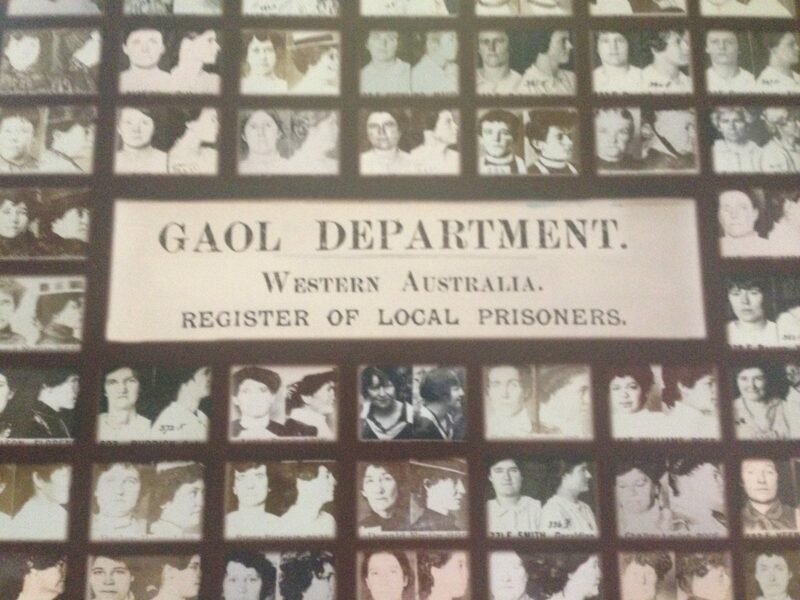 Women could be imprisoned for merely ‘loitering in public places’ ‘being idle,’ or ‘having no visible means of support.’ Aboriginal women could be imprisoned for entering Perth without a permit or for escaping their settlements – things were especially tough for them. In 1991 the prison closed and development into one of the state’s major historic heritage sites began. Now it’s a first class visitor attraction as well as a visible reminder of fascinating slice of Australian history. Check mate – or cell mate? Lovely suggestion. Freo is a lovely place to visit. I took a boat up the river from Perth. The Little Creatures brewery is another top tip for Fremantle.